Tom Maceri and Son has been in the produce industry for over 80 years. Sam Maceri Sr. started Tom Maceri and son produce in 1936. Sam started off working along with his father, Tom Maceri, taking produce to the homemakers waiting on their front porches for the daily arrival of the pickup truck. His father became ill with a heart condition and was no longer about to work or provide for his family. It was then, at the age of 13, that Sam Maceri started going door to door selling produce on a peddle truck. Sam bought three bushels of cabbage from a farmer at Eastern Market in Detroit at three bushels for 50 cents. Then beginning on Woodward in Highland Park, he began visiting restaurants offering the fresh cabbage at three bushels for $1.00. Sam sold the whole load and made more money than ever before, it was then that Sam realized wholesale was for him. His Father. Tom, bought a new truck and let Sam have the old truck. 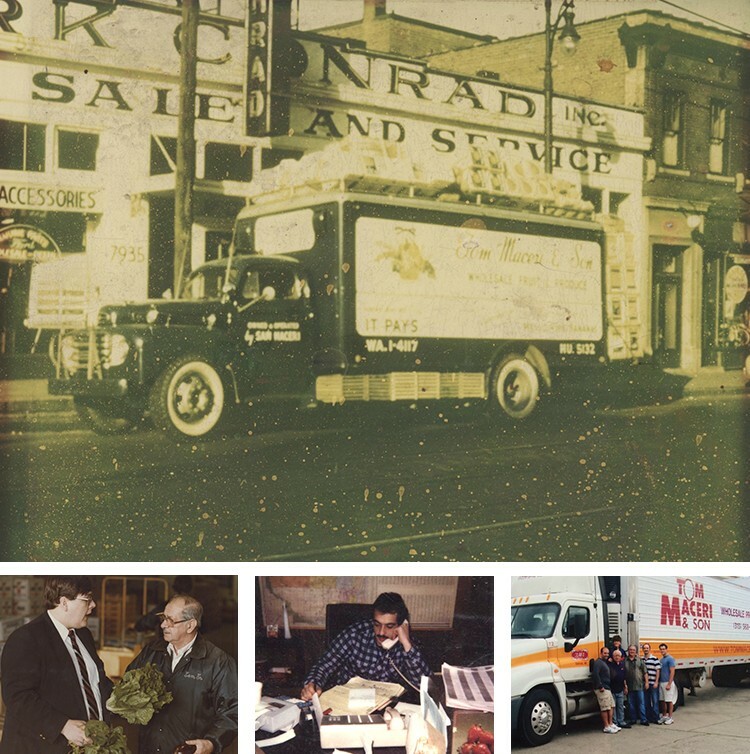 On it was painted “Tom Maceri.” Sam painted underneath it, “And Son.” Year after year he took care of his customers faithfully, and the word spread about this reliable service with fresh produce. Institutions of all kinds were added to the growing list of restaurants. Each morning beginning at 3 am the fresh produce begins arriving directly from the farmers of Michigan or trucked in from the farmers of other states, and then is trucked out to restaurants and institutions. Following in Sam Sr. footsteps, his son Sam Jr., started working at Tom Maceri and Son as well. Sam Jr. started working for Tom Maceri and Son as a truck driver, delivering produce. In 1976, Sam Sr. and his son, Sam Jr., became partners. In 1997, Sam Jr. son, Sam III, started working for the family business. In 1999, Sam Jr. middle born son, Tom joined the team and in 2003 Sam Jr. youngest, Steve became apart of Tom Maceri and Son as well. After operating the family business out of a 20,000-square-foot warehouse in Detroit’s Eastern Market for 20 years, Sam Jr. oversaw the construction of a 75,000-square-foot facility in St. Clair Shores, Michigan. We are now operated by the third generation, Sam III, Tom and Steve, and have grown to be one of Michigan’s largest full service produce distributors. We have a modern refrigerated truck fleet which helps to ensure quality and timely deliveries.The company now services 6 states, which include Indiana, Ohio, Illinois, Wisconsin, Florida and Michigan. We are a full line Produce Distributor specializing in buying the highest quality products in the industry. We turn our product better than anyone in the industry and work hard to ensure minimum out of stocks. Our company’s primary focus is to meet the needs of our customers. We offer custom merchandising assistance, custom ad plans, detailed product movement reports, and in store training from our account executives which combined have over 250 years of experience.